Sept. 24, 2009 -- The Arkansas State University Museum, 110 Cooley Drive, Jonesboro, will open its new exhibition, "Exploring the Frontier: Arkansas 1540–1840," on Saturday, October 3, with ASU Museum Family Time at 9 a.m.-11 a.m. and HiStory Time at 2 p.m. In honor of Arkansas’s international history, an International party will be held at 3 p.m. The exhibition will run through March 2010. This exhibition, an Arkansas Discovery Network Road Trip, offers visitors the opportunity to plan an expedition, to track their own journeys, to visit a fur trapper's camp, and to enjoy paddling the life-sized replica of the Griggs Canoe, a centuries-old Native American canoe. The earliest European explorers to reach Arkansas were the Spanish explorers led by Hernando de Soto in 1541—long before the Pilgrims landed at Plymouth Rock, Mass., in 1620. The only Revolutionary War action west of the Mississippi River occurred here, and river pirates once roamed these waters. The Mississippi River’s Delta region was explored by the Spanish in the 1500s. The French traveled from Canada to Arkansas in the late 1600s. Arkansas Post, founded in 1686 by Henri de Tonti, was the first European settlement west of the Mississippi River, predating the founding of St. Louis and New Orleans. On the frontier, wits and wiles meant the difference between death and survival. 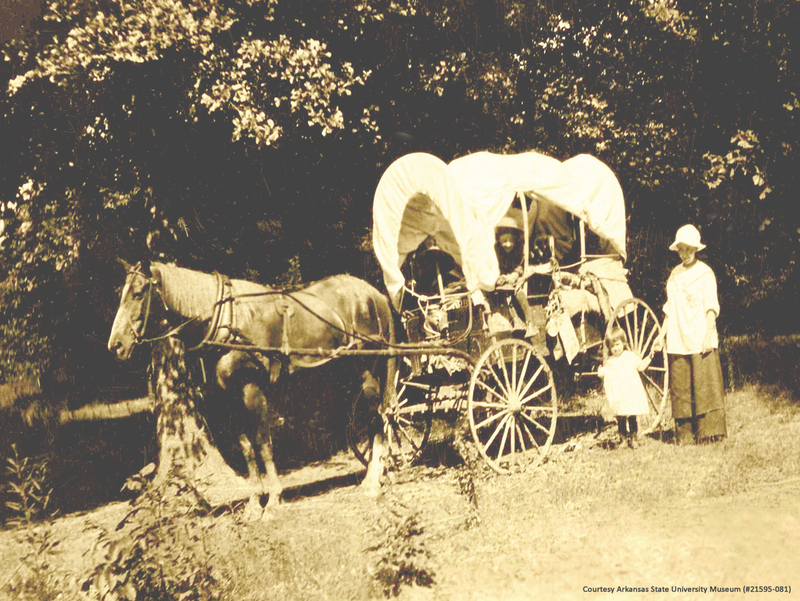 “Exploring the Frontier” is one of seven Arkansas Museum Road Trips sponsored by the Arkansas Discovery Network, funded by the Donald W. Reynolds Foundation. For more information about these Arkansas Museum Road Trips, scheduled to travel throughout Arkansas, visit http://www.arkansasdiscoverynetwork.org/RoadTrip/index.html. "Exploring the Frontier" will spark the imagination of children and adults alike. Bring the children and grandchildren for a fascinating introduction to Arkansas history. The ASU Museum is open on Tuesdays from 9 a.m.-7 p.m.; on Wednesdays-Saturdays from 9 a.m.-5 p.m.; and on Sundays from 1-5 p.m. The museum is closed on Mondays and on university holidays. Admission is free thanks to the Arkansas Discovery Network that is funded by the Donald W. Reynolds Foundation. The ASU Museum is an accredited member of the American Association of Museums. For more information, visit the ASU Museum online at http://museum.astate.edu, e-mail Lenore Shoults, assistant director for the museum, at lshoults@astate.edu, or call the ASU Museum at (870) 972-2074. Photo courtesy of the Arkansas State University Museum.